Gin distilleries used to be found across the British Isles, but, until recently, after decades of shrinkage, gin distilling was concentrated in London with just a few outposts in the Midlands, Scotland and Plymouth (flying the flag in the West Country). But Edinburgh, one of the gin capitals of the UK (given the number of fine gin bars there, not least Bramble Bar) was without a distillery. Until now, that is. The gin is distilled in a 500 litre copper still named “Gert”, which is heated via a custom bain-marie system, designed to heat the botanicals without overcooking them. Nose: Lime and coriander jump out immediately, followed by the juniper and then some spice. Taste: This has a lovely, smooth texture with very little burn and a light, silky start, as well as a touch of lime, a little fennel and anise. The flavour then builds, bringing in a dry, slightly floral juniper and coriander, followed by a subtle twist of spice. The finish is of dry juniper and angelica – very classic. Overall, this is a very silky and sippable gin and, despite having a fair bit of spice, including cloves and cardamom, thankfully these are not too heavy and do not detract from the flavour of this particularly balanced gin. This is quite a light and airy Gin & Tonic, with the lime coming through well, accompanied by some coriander and some of the gin’s spiced elements. The finish is a mixture of earthy, bitter quinine and dryness from the angelica and juniper. Delightfully refreshing and with a lightness that makes it perfect for the afternoon. Spice and coriander come through. This is also rather citrusy, with a fresh lift from the lime, making this a clean, crisp and excellent Martini. My garnish recommendation would be a lime twist. A well-integrated and smooth Negroni that has a lively kick at the end, courtesy of a combination of the following flavours: citrus, dark chocolate, and an earthy, herbal bitterness. Although the Campari only comes through at the end, it provides a bitter and intense finish to the drink that lingers on and on. Rather delightful: the citrus notes contrast nicely with the smokiness of the Scotch, resulting in a wonderful smoky lemon-lime flavour. This is one of the more subtle Islay Scotch Martinis, but, nonetheless, I think that it works rather well. Although Pickering’s Gin has a lot of classic characteristics, a more contemporary flair is also apparent with the use of lime. The result is a fresh and light gin that still has plenty of flavour and is equally pleasant drunk neat and in mixed drinks. My favourite drink was the delicious Gin & Tonic. Gin is booming in Scotland, with new distilleries opening and a number of new gins being released from existing establishments. Along with Sloe or Aged Gins, Navy Strength Gin (57-58% ABV) is a common second product for distilleries to release. Nose: Green juniper and rich spice, resulting in a clean, but highly aromatic nose. Taste: This has a thick and oily mouthfeel, and plenty of juniper come through, along with a little coriander and sweetness, before some sweet, slightly bready spice. This is particularly mellow for a Navy Gin, but has more power on the finish. Rich and bright juniper; fresh, with a touch of bitterness and sweetness. There’s then some warm spice – cinnamon and ginger – and a well-rounded bitterness at the end. This is a cocktail with a lovely selection of big flavours: a mix of juniper and more subtle spice notes. Towards the finish, there are notes of chocolate and bright citrus. Pickering’s Navy produces an intense Negroni – the extra ABV really carries the gin through the vermouth and Campari. There’s a touch of menthol bitterness on the finish, which is long and lasting. 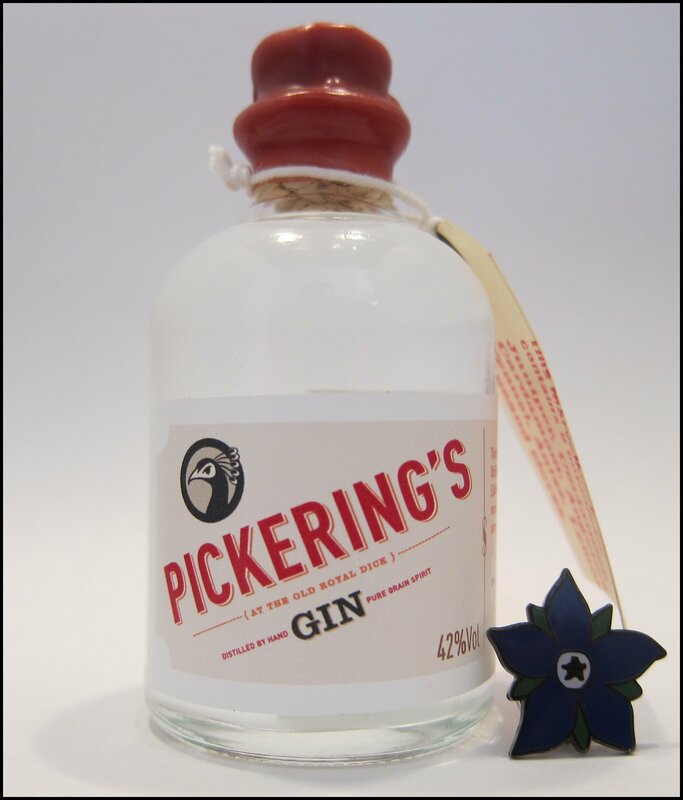 Pickering’s Navy Gin is a bold and flavoursome gin with the distinctive spice element that is in equilibrium with the other botanicals, stopping it from becoming a “Christmas spice bomb” of a gin. The Negroni had excellent flavour, but my favourite drink was the Gin & Tonic, which had just the right level of spice – not an easy thing to do! Pickerings 1947 is a limited edition (only 1,000 bottles made) gin that has been released to celebrate the 2015 Royal Edinburgh Military Tattoo. The recipe is made precisely to the original recipe that their flagship gin is based on, which was dated 17th July 1947 and written in Mount Mary, Bombay. It is bottled at 42% ABV. Nose: Warm spice and citrus with a hint of light, woody salinity. Taste: This has quite a thick texture, with an array of woody, earthy spice notes, such as cassia and nutmeg, as well as dry, oaky notes. The dryness comes through towards the end, accompanied by anis and a hint of black pepper. A pure and spicy Gin & Tonic from the first sip; thankfully not too sweet, with a nice citrus fruitiness on the finish. Herbaceous, with sweet spice, before the dryness of the vermouth and complex flavours from the fruity floral dryness of the gin, resulting on a long, clean finish. A lightly sweet Negroni with a hint of nuttiness, before the dry, herbaceous, bitter vermouth and a light, bitter-sweetness from the Campari. The finish is long and dry. I find the exploration of old gin recipes to be fascinating and it’s great that more distilleries have the freedom to develop and release these historic editions. My favourite cocktail with Pickerings 1947 was the Martini. Arbikie Gin aka Kirsty’s Gin is named after distiller Kirsty Black who created the recipe for the gin. Unusually Arbikie don’t just distill the botanicals but they actually make the base spirit used to make the gin which is the same spirit as their potato vodka. This spirit is distilled in Inverkeilor, Angus, Scotland and is made from Maris Piper, King Edward and Cultra varieties of potatoes. Potato based is quite tricky to get right and often a perfumed fruitiness can overwhelm the botanical so I was very keen to try this one. Nose: Citrus and juniper, as well as bright, aromatic coriander, followed by some soft, herbal notes. Taste: A full texture with some rich, dry fruit notes upfront, followed by pepper spice, sparkling juniper, and zesty citrus. A full-bodied gin with excellent balance and intensity. Packed full of flavour, with vibrant, woody juniper notes as well as some sweet, herbal notes and a little fruitiness, all before a clean, bitter finish and a touch of cedar. This is a drink with a certain brilliance, especially when served ice cold. The juniper bursts forth, before being followed by a smooth, plump texture, hints of spice, pepper, and citrus. It leaves you with a delightful glow. Arbikie Gin makes a fruity and relatively sweet Negroni with a body of plump stone fruit, followed by dark chocolate and coffee notes, then an earthy bitterness on the finish. Arbikie is a shining example of a potato-based gin. In fact, it’s one of the best that I have ever tasted. It has an excellent balance between the character of its botanicals and that of the base spirit. My favourite drink was the Martini. 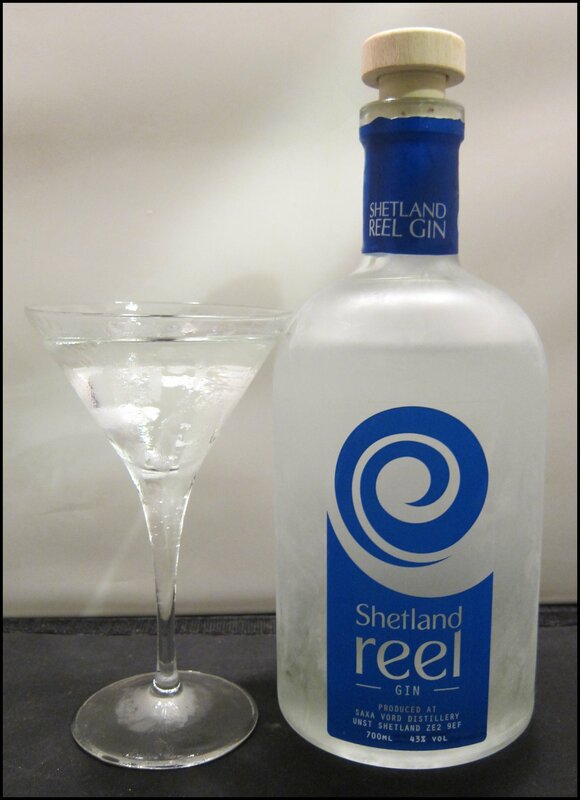 I first met Stuart of Shetland Reel Gin at the 2014 Distilling Expo in London. I have to admit, I was excited when he told me about his plans to make gin in the Shetlands, so it was great to recently get a chance to try the product and it was certainly worth the wait. Shetland Reel Gin is made at the Saxa Vord Distillery on the island of Unst. It is bottled at 43.0% ABV and its botanicals include: juniper berries, coriander seeds, orris root, cassia bark, and citrus peel. Nose: A delightful flutter of leafy green notes, followed by crisp juniper, then coriander, citrus and spice. Wonderfully inviting; holding great promise for the flavour. Taste: A little sweetness to start, which parts ways for an array of fresh leafy and piney notes, as well as some dryness from angelica. Then you get a little aromatic spice from the coriander, which hangs around right until the finish. This is a very smooth and refreshing spirit – it’s really very nice to sip. A lovely fresh and slightly soft Gin & Tonic: very easy to drink, with some delightful, fresh leafy and floral notes, before a dry finish. This is a Gin & Tonic that will appeal to both traditionalists and gin converts alike. Simply delicious. Excellent – truly first class. It has all of the crisp and dry elements that you would expect from a Gin Martini, but with a delicate, fresh flourish that adds a refreshing flair. There are also notes of spice, with angelica, juniper, and a leafy succulence add depth and complexity. This makes a fresh Negroni with light, fresh leafy notes, as well as some spice, pepper, and anise. The gin’s flavours are upfront, followed by sweet vermouth notes and then the bitterness of the Campari. All of the flavours of the ingredients come through well, creating a lovely drink. Shetland Reel Gin not only comes from the UK’s northern-most distillery, but it is also delicious and – at the end of the day – that is what is really important. It mixed well in all of the above drinks, but my favourite had to be the Martini. As the rise of craft distilling in the UK continues, it is great to see Scotland’s largest city get its own independent craft distillery. After all, Edinburgh already has Summerhall and the Edinburgh Gin Distillery. The Makar gin (the Scots word for poet) is made at the Glasgow Distillery in West George Street, Glasgow. It boldly proclaims that it is “juniper-led”; this is the first time I have seen this so prominently displayed on a bottle but with so many craft gins embracing the contemporary style it makes sense. The gin is bottled at 43.0%abv and contains a mix of seven botanicals (the gin itself fittingly comes in an attractive heptagonal bottle) which include: juniper, coriander, angelica, lemon, liquorice, black pepper and rosemary. Nose: juniper led for sure on the nose, fresh spruce and sappy juniper, vibrant and exciting, there is then some citrus followed by a touch of woodiness and floral herbal notes of rosemary. Very inviting. Taste: A strong and bold flavour, bursting with green, sappy, resinous juniper pine notes. The bottle says, “juniper-led” and it’s not kidding; this is an excellent option for folks who find many modern gins too light on the juniper. Citrus and coriander notes follow, with dry angelica on the finish, before fragrant, herbal rosemary. A tasty and juicy Gin & Tonic, with rich and full notes of piney juniper that add a clean crispness to the drink. This is a textbook Gin & Tonic – certainly worth trying. A fragrant, yet dry Martini. The bitters and garnish draw out the rose aromatic elements of the gin. This is all followed by a spicy and peppery finish. Smooth and clean, this is a pleasant alternatie to the more common citrus-led Martinis. Oily resinous pine-juniper, thick, viscous and luxurious texture. Just superb. This makes way for some citrus and the complex rosemary that, apart from strong juniper, a re becoming a signature for this gin. Quite a herbal Negroni; the rosemary really comes through. The gin stands up well to the strong flavours of the vermouth and Campari , and makes a cocktail that is herbal, but more aromatic than earthy – excellent. Fruity berry and stone fruit notes are followed by coriander and floral, juniper-pine. A light and refreshing drink and a very pleasant way to appreciate this gin. Maker is an excellent gin and proof that a traditional style is far from boring and there is plenty of space to differentiate. I enjoy sipping it neat and in. Negroni although I didn’t find anything I didn’t like it in. 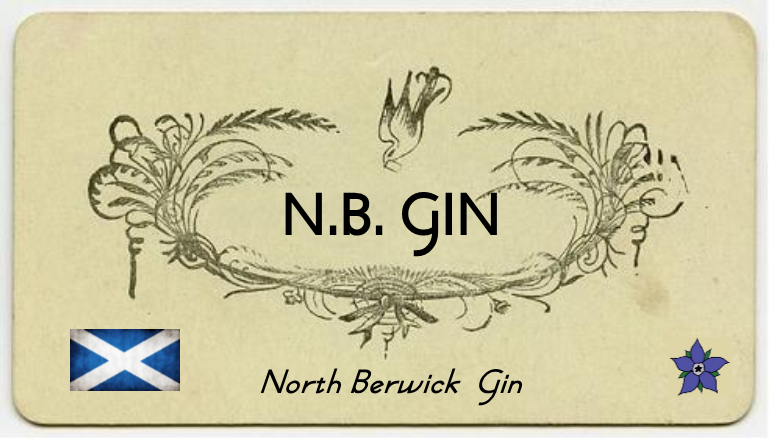 2013 saw a great boom in the launching of British Craft Gins and, towards the tail end of the year, North Berwick (NB) Gin from Scotland (25 miles North-east of Edinburgh) joined the ranks of an exciting and creative wave of new gins. Nose: Pine, with a little brine and some sweet, floral spice. Taste: A smooth texture, with a hint of creaminess. This is certainly a sippable spirit, with notes of juniper, coriander, and angelica, followed by a touch of sweet, exotic spice and a burst of citrus. The finish is long, lingering and of juniper, with a little warmth. A clean and refreshing Gin & Tonic: crisp; the sort of drink that you crave after a long, hot day. There’s also a great touch of spice and citrus. Lovely and classic – simply superb. This is a Martini that will please even the most discerning drinker. The flash of spice towards the end makes for a perfect finish. Always a good way to measure a gin, the NB Negroni is a textbook example. There’s dry juniper to start, with a little spice from the cassia and cardamom in the background. This is followed by bright, lemon citrus and, finally, the deeper herbal notes and bitterness of the vermouth and Campari. NB Gin is everything gin fans are looking for and a bit more besides; there are some very classic gin characteristics but the finally flourishes of the spice botanically adds a distinctive twist. The Martini was my favourite drink. One of the best things about writing about gin is that surprises lurk around every corner. Last month, I spoke about a serendipitous tweet that introduced me to the excellent Warner Edwards Gin and something similar happened this month; this time, with a craft distillery in Scotland who make a gin called GILT. 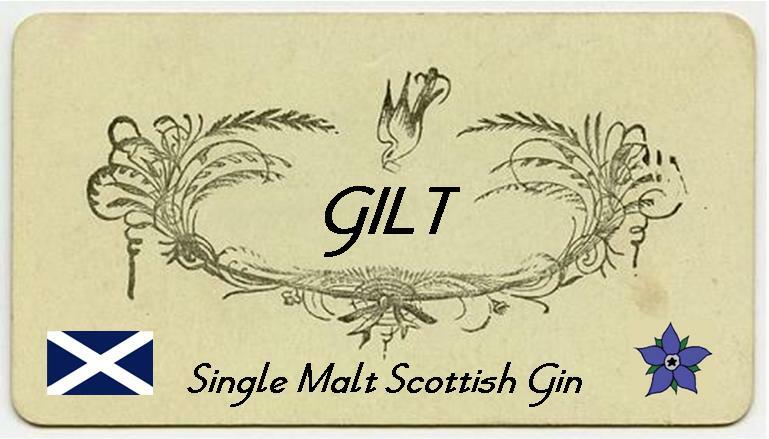 GILT Single Malt Scottish Gin is made by the same folks who are behind VALT Single Malt Vodka, which I tried at the first Boutique Bar Show in 2007 at Brick Lane (coincidentally, on the same day as a Tube strike) and, I must say, tasting the vodka left an impression on me; it’s very good. Nose: Juniper, hints of vanilla and grain. Ever-so-slightly acidic. Taste: Dry juniper upfront, followed by coriander and then some notes of malt and hops. In the middle, there are some toffee-vanilla notes, followed by citrus, spice and a light, liquorice sweetness. The finish is fresh, with lots of citrus and orange in particular. This is something different for a Gin & Tonic: there are some great earthy and bitter, bark-like notes. It’s good and fresh, with some sweeter citrus notes and subtle hints of cardamom coming through, too. The finish is particularly dry. This is reminiscent of the excellent FEW Gin from Illinois, which has a similar grain-heavy, slight creamy underlying character. The barley and creamy notes of the gin’s base work well with some of the vanilla and herbal notes of the vermouth. I used my standard 4:1 Medium-Dry ratio for this cocktail, but this tastes much wetter than that so, if you like your drink dry, then you might need to tinker a bit. Hints of anise, cardamom and chocolate also appear at the end, concluding a well-rounded and pleasant drink. Quite a smooth and creamy Negroni, with a fair dose of vanilla coming through. That said, it’s not sickly. There are some orange notes, too, before the bitter-sweet finish of the drink, which is long and bitter, with just a hint of spicy, almost gingery, warmth. A natural match for this gin. The whisky character that hides in the background of the juniper spirit lends itself well to the mix of sugar and bitters, providing the warmth that you would usually associate with this drink, along with slight malt, vanilla and barley notes. The botanical mix, especially the spice notes, work well with the bitters. I really enjoyed experimenting with GILT gin and I shall, no doubt, mix some other cocktails with it, too. I have enjoyed gins with a white whiskey base, like FEW, before and it is good to see what is effectively a gin with a “new-make Scotch” base as a counterpart (this is rather sloppy and inaccurate terminology wholly on my part; but I think that it “paints a picture” of the gin’s style). The Old Fashioned is superb, as is the Negroni. 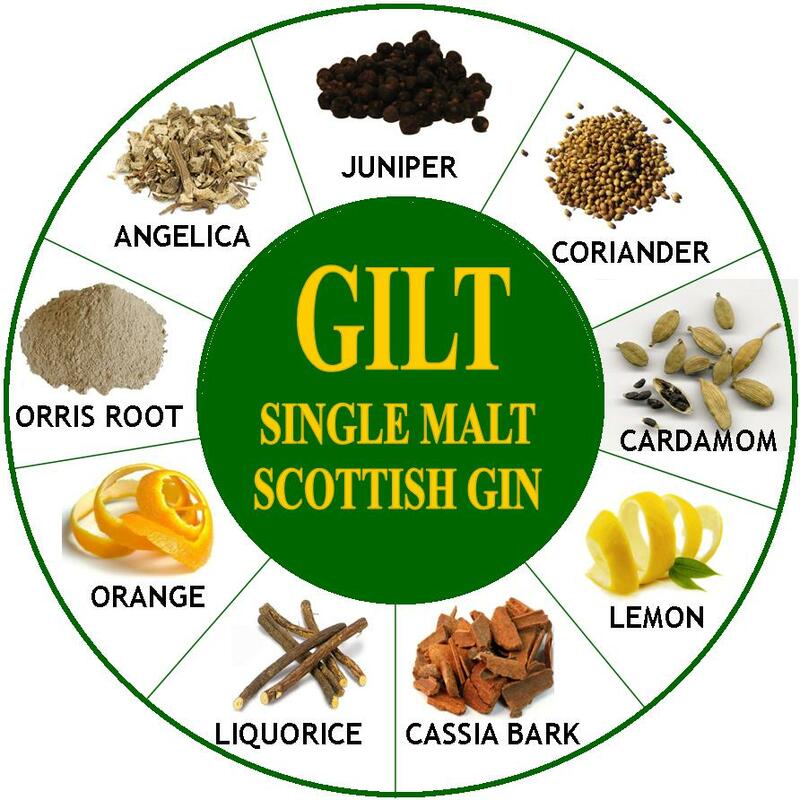 GILT Single Malt Scottish Gin is available for around £30 for 70cl from drinkon.com. 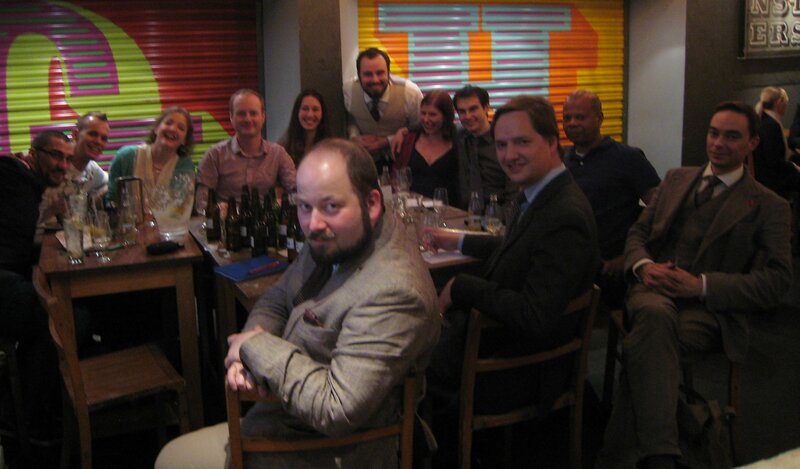 I was particularly interested as to whether or not there were any shared characteristics amongst the group that might not be so common in non-Scottish gins; this will be addressed at the end.The tasting was conducted at Graphic Bar in Golden Sq., Soho; a fine example of a Modern Gin Palace with a range of over 130 gins. The panel was made up of willing volunteers from The Juniper Society, which is hosted by Graphic two times a month. The gins were tasted blind and we tried them on their own and with tonic water, with no garnish. The gins are listed in the order tasted and alcoholic strength is denoted by %ABV. This made by Cadenhead and was created in 1972. It contains 8 botanicals and then has saffron added to it. Rather than being clear, it is a light golden colour; having said that, only one member of the panel noticed this. Nose: Juniper, citrus, slightly floral. Taste: Strong flavours: lime, juniper, citrus and coriander. Not massively complex, but lots of flavour. With tonic: The panel found this rather pleasant, and spicier with tonic. Fresh and refreshing, it was thought that it wouldn’t really need a garnish. For more information on Old Raj click here. Old Raj Red is available from The Whisky Exchange for around £23 for 70cl. Taste: Almost all of the panel found strong flavours of nutmeg and cinnamon, as well as some creaminess and a Plymouth-like sweetness. With Tonic: Mixed views here: some of the panel found it clean, crisp and liked its spiciness, but others found it to be a bit flat. 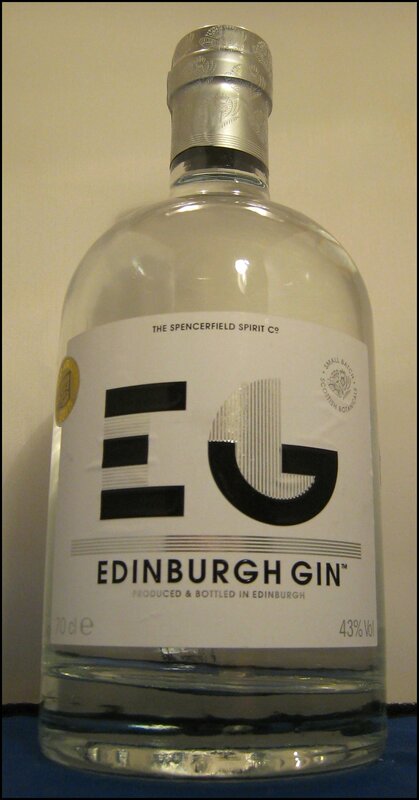 Edinburgh Gin is available from The Drink Shop for around £25 for 70cl..
Made by the same folks as Old Raj Red and Blue. Taste: A more intense taste than nose, with heavy juniper, some pepper, citrus and a hint of bitterness, rather like a classic London Dry Gin style. One of the panel described it as “rather lovely”. With tonic: Dry and bitter, with a little sherbet sweetness. Generally the panel thought that this was a robust, no nonsense Gin & Tonic. Cadenhead’s Classic Gin is available from The Whisky Exchange for around £25 for 70cl. Made by William Grants and containing 13 botanicals. The gin is made using a combination of distillation from both pot and Carterhead stills and is finished off with the addition of cucumber and rose essences. Nose: Fresh, leafy, floral, cucumber rind. Taste: Fresh, smooth and silky. Floral, in particular rose and lavender. A general, green leafy flavour; maybe cucumber? One panelist described it as “pretty”. With tonic: Refreshing, crisp and fresh. Delicious; this was very popular with the panel. For our full review Hendrick’s click here. Hendrick’s UK is available from Tesco and Waitrose for around £22 for 70cl. Caoruun contains five Scottish Celtic botanicals; dandelion, bog myrtle, heather, coul blush apple and rowan berry. Taste: Quite light, a musky juniper and citrus as well as some earthy notes, very clean, quite nice. With Tonic: A soft flavour, juniper, citrus and quite smooth. 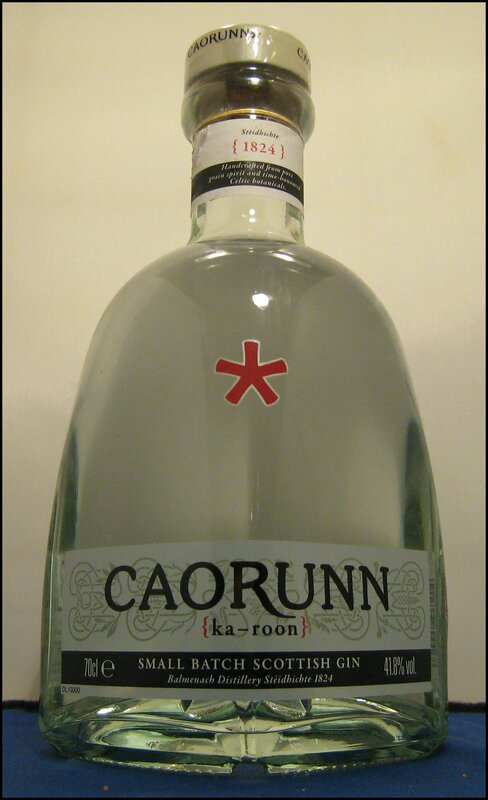 Caorunn is available from Master of Malt for around £25 for 70cl. This is the US version of #4, which is bottled 2.6%ABV higher than the UK version; it makes a surprising difference to the taste. Nose: Minimal citrus, some juniper, strong floral. Taste: Very floral, with hints of lavender, violet, rose, plus juniper and some green leaves. With Tonic: Very tasty; well-balanced, flavourful and fresh. A real hit with the panel, although one member would prefer to drink it on its own than with tonic. This made by Brudladdich, a Scottish whisky distillery in Islay. It contains a staggering 31 botanicals, a list of which can be found here. Nose: Quite soft; juniper, spice, a slight soapy, floral quality. Taste: Juniper and coriander and quite a heavy perfume quality, with different flowers and herbal notes. Quite smooth and a long finish. With Tonic: Rather pleasant, with a good finish; balanced. This was particularly liked by one member of the panel. 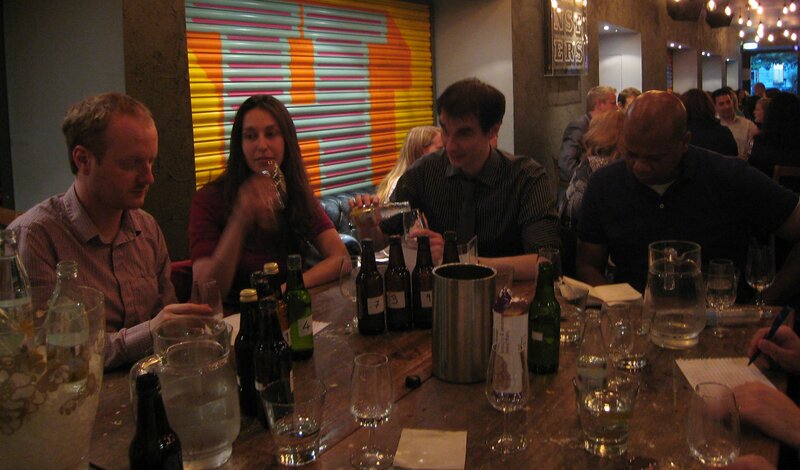 For our full review of The Botanist click here. The Botanist is available from Master of Malt for around £25 for 70cl. Nose: Floral, herbs, pine, vanilla. Taste: Quite a complex taste; herbs, lavender, spice, cinnamon, angelica and, towards the end, a vanilla-oak note. Quite strong, alcohol-wise, but this comes through as warmth rather than burn. With Tonic: An excellent fresh and moreish gin and tonic, this was a favourite of a few of the panel members. 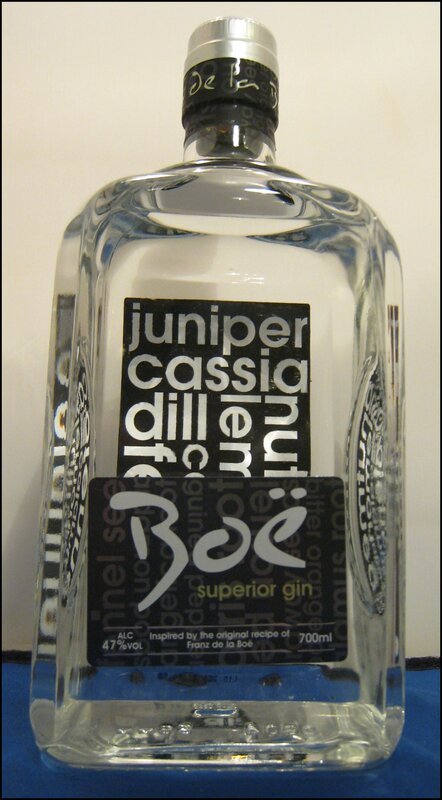 Boe Gin is available from Master of Malt for around £28 for 70cl. The high-strength version of Old Raj Red. Nose: A very strong nose; almost perfume-like, with juniper and flowers. Taste: The perception of alcoholic strength continues in the flavour, as does the juniper and refined floral notes. With Tonic: The panel thought that this Gin & Tonic had a real kick to it and that it tasted very strong; that said, most of them really enjoyed it and their drinks were quickly finished off. For our full review of Old Raj click here. Old Raj Blue is available from The Whisky Exchange for around £26 for 70cl. Named after the husband of Mary Queen of Scots and containing six botanicals including locally sourced Elderflower this is the newest Scottish Gin on the market. Nose: Juniper, floral a slight mineral quality. Taste: Very soft with a water-like smoothness and a slight warmth at the end. Juniper and rather floral with hints of rose and violets, long finish. With Tonic: Soft, flavourful and refreshing. Rather pleasant although less intense then some of the others. For our full review of Darnley’s View click here. Darnley’s View is available from Royal Mile Whiskies for around £25 for 70cl. A scottish Gin using a variety of botanicals include those that grow wild in the Shetland Isles. 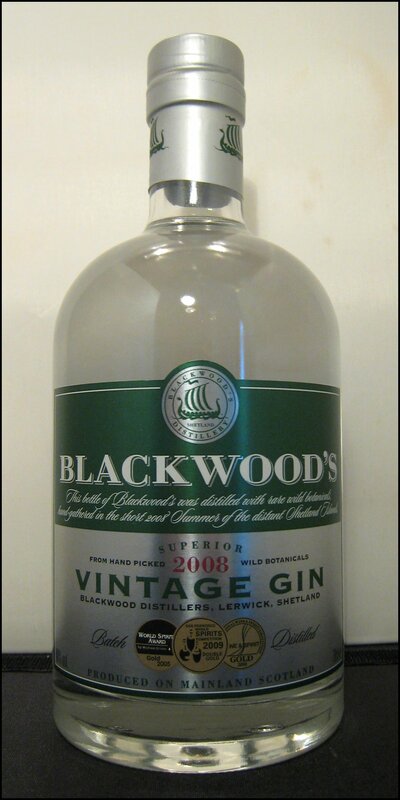 Blackwoods also make 60% version of their gin. Nose: Strong and complex with juniper, citrus and earthy herbal notes. Taste: Very smooth and soft, citrus juniper and herbs as well a s touch of floral. Juicy and excellent. With Tonic: Very refreshing and juicy as well as being full of flavour. Blackwoods is available from The Whisky Exchange for around £19 for 70cl. Each member of the panel ranked their top three gins and these choices were recorded. We then allocated points as follows: three points for a first choice, two for second, and one for third. After the tasting and some thought, I remain unconvinced as to whether there is a particular set of flavour characteristics common to Scottish Gins; some seemed to be more floral and less juniper-led then a London Dry Gin, but then others seemed rather classic in style. The control gin (meant to stand out as a classic style) was lost amongst the rest of them. There was definitely a trend for the bottles to emphasise their Scottish heritage and quite a few use locally sourced or indigenous botanicals – heather and bog myrtle being quite popular – but this is no different to the sourcing techniques of other gins such as Moore’s (Australia) and Death’s Door (Wisconsin, USA). 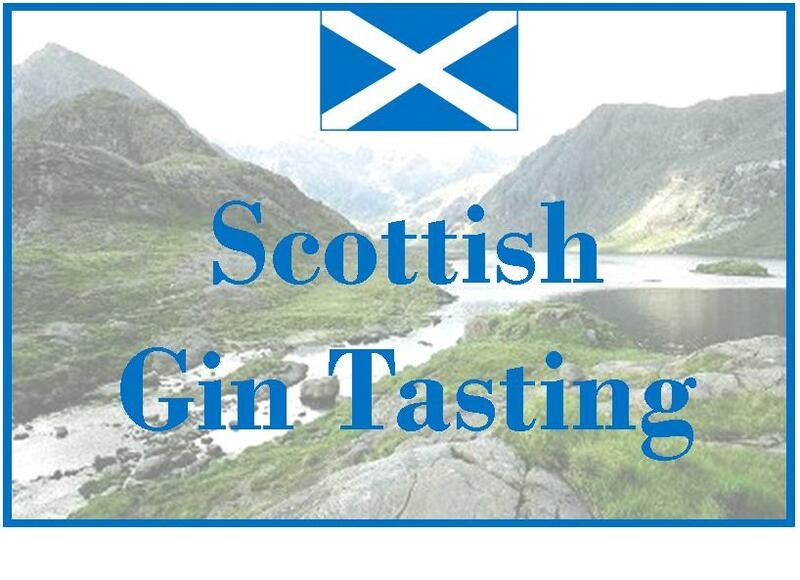 Many thanks to the panel, Graphic Bar and the Gin Producers of Scotland for making this article possible. *I’ve not included Tanqueray and Gordon’s as they used to be made in London and the move to Scotland was one of economics. In addition, today there is, otherwise, nothing particularly Scottish about them.